There's a show on Disney Channel which is Disney's answer to the wildly popular (and lucrative) Bob the Builder and Dora the Explorer. Handy Manny features the voice of That 70's Show Wilmer Valderrama as a bilingual repair man who happily takes his talking tools around town repairing things while whistling a merry tune and dropping Spanish vocab to four and five year olds. My boys are too old for it, but Michael and I sing the (very) annoying theme song whenever we do something particularly handy around the house. 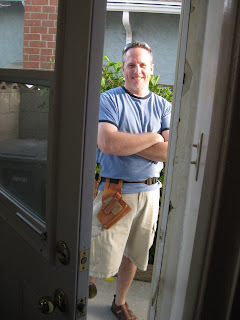 Today I had my very own Handy Manny in Michael, who ripped out the door on our service porch and replaced it with a pre-hung fiberglass door all by himself. Is there nothing my man cannot do? Now instead of a door that was literally falling apart and provided no security, I have a beautiful door to lock out the bad guys and still give me a view of the lemon tree while I do laundry! Very nice! We left a long list of things on our house that need to be repaired and/or replaced immediately for our landlady and didn't hear from her for days. We called and stopped by, but nada! It turns out she went on a trip to Sweden, got sick, had surgery, and is still there in the hospital. At over eighty years old, my guess is that she's not coming home any time soon. So we finally got in touch with her daughter who said we could go ahead and do the repairs ourselves and get reimbursed, and that she'd hire a plumber for the one repair beyond our skill set. Yes, I know we're giving her free labor, but if I have to wait for months on end for a broken window, a burst pipe, and a busted door to get fixed, I will not be a happy Mama. And you know what they say about what happens when Mama ain't happy! So between Mike and our friend Ron (check out his new blog about home repair!) we are making it happen ourselves. And tonight, with my beautiful safe new door installed, this Mama is happy! 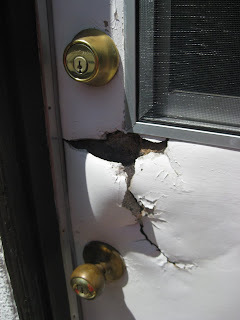 Here is the busted door. It was so warped that if you were to lean on it with all your body weight you could've walked right into our house. NOT good! 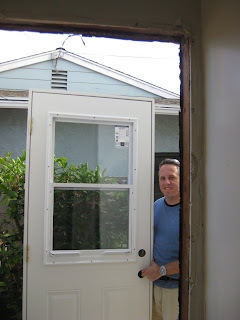 Michael ripped out the old door and the frame, and installed a brand new pre-hung fiberglass door. The new door in place! All it needs is some molding around the door frame and we've got ourselves the nicest door on the block! And that guy there in the tool belt is pretty cute, too.